In the climactic scene in Lady Bird, Greta Gerwig’s new coming-of-age dramedy, the titular protagonist Christine “Lady Bird” McPherson (Saoirse Ronan) is riding shotgun with her (kinda? sorta?) boyfriend Kyle when the song “Crash Into Me” by Dave Matthews Band comes on the radio. Kyle (Timothée Chalamet) promptly declares that he hates this song, because of course he does. Kyle is a self-styled sophisticate in a world full of conformist dolts. He reads Howard Zinn. He rolls his own cigarettes. He plays bass in a rock band. And when he’s not in his Catholic school uniform, he wears all black. Dave Matthews Band — with its middlebrow, mainstream radio bro-rock — offends every aspect of his well-curated hipster sensibility. But Kyle’s comment prompts Lady Bird to loudly admit that, actually, she loves “Crash Into Me.” It reminds her of her best friend Julie whom she has been neglecting recently, and she resents pretending otherwise for Kyle and the rest of his Cool Guy group of friends. And rather than continue her performative rebellion, Lady Bird has Kyle drop her off at Julie’s so they can reconcile and go to prom together. It’s a heartwarming scene, one that reiterates the timeless lesson of learning to accept and love your true self instead of toiling to be someone you’re not. But the scene also forces us to seriously re-examine Dave Matthews Band, a band as heavily derided as it is enduringly popular and successful, and whose change in cultural perception mirrors how we perceive and appreciate culture writ large. Throwing on my navy Ralph Lauren polo, grabbing a case of Busch Light, calling my bros to see if they wanna rock out to some Dave and play some bags. I identify with Lady Bird’s begrudging DMB fandom, because like every other white, upper-middle class suburban Chicago kid going through puberty in the 2000s, enjoying Dave Matthews Band was a requisite part of adolescence. Attending a Dave show was considered the height of cultural experiences, and wearing a T-shirt you bought at said show — or adorning your car with a Dancing Nancy decal on your rear windshield — were ways to communicate your cultural sophistication. It wasn’t until my senior year of high school, when I read Chuck Klosterman’s Fargo Rock City, that I learned Dave Matthews Band and its fans were considered a laughingstock among critics and record-store clerks. DMB were responsible for the worst albums of the 1990s, Klosterman wrote, and in subsequent interviews, he said he’d gladly pay $400 to never hear the band’s music again. Klosterman wasn’t alone in his DMB disdain, either. In a 2011 Salon essay, Denise Grollmus, ex-wife of Patrick Carney, drummer from blues-rock darlings The Black Keys, slammed her ex-husband’s band partner Dan Auerbach by saying he was “a soccer jock who idolized Dave Matthews” before he reinvented himself as a retro rocker in a black leather jacket. Dave Matthews Band wasn’t only not cool, it was aggressively un-cool, and anyone who liked DMB was similarly lame. Like everyone, I like to believe that I’m unaffected by other people’s opinions of me, but like everyone, I am, and I remember being incredibly embarrassed when I learned the argument against DMB. My entire worldview was shattered. Klosterman was a writer I enjoyed and admired, and to that point, I assumed we had nearly identical taste. Worse was the revelation that I’d been unironically listening to a band that Serious Music Appreciators (a group I considered myself part of) openly mocked. To quickly regain my self-respect, I decided to embrace The White Stripes, Spoon, LCD Soundsystem and the other groups associated with the post-punk, garage rock revival in the mid- to late-aughts. Anyone wanna tell me why I'm having the urge to go through another early Dave Matthews Band phase? I already did this 20 years ago. But I also was struck by how antiquated this binary distinction between good and bad music seems in our current context, where the prevailing critical theory is “poptimism,” which posits that pop stars that appeal to “average” music fans (e.g., Ed Sheeran, Rihanna and Katy Perry) deserve as much serious consideration as the Jack Whites of the world. Under this school of thought, DMB is one of the most culturally important groups in the history of popular music. 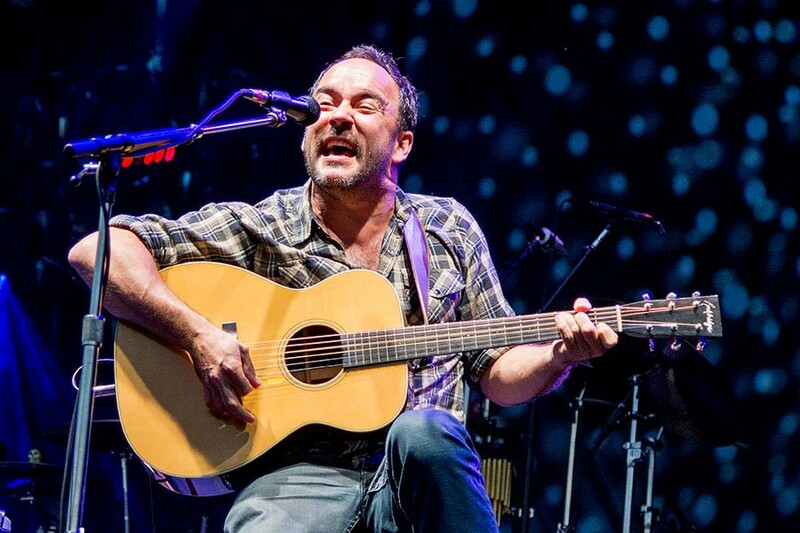 Well into its third decade as a group, Dave Matthews Band continues to sell out venues across the world, making it one of the most successful touring acts of all-time. Its upcoming February 3rd show at the Xcel Energy Center (capacity: 18,000) in Minneapolis is already sold out, for example. Similarly, it grossed $776,969,736 — three-quarters of a billion dollars — from 1990 to 2014, making them the sixth highest-grossing live act during that period, behind The Rolling Stones, U2, Bruce Springsteen, Madonna, Bon Jovi and Elton John. (That’s pretty good company for a band derided as being beloved by yoked white boys with no taste.) And despite having not released a new studio album since 2012, they still rank among the top 25 earning musical acts in the world each year. And yet, in a lot of ways, it’s taken Lady Bird for fans on either side of the DMB divide to reassess their relationship with the group. For DMB fans, the movie has done the same thing Fargo Rock City did for me — alerted them to the fact that DMB is considered “bad” music. I didn't know how many people disliked Dave Matthews Band until I saw people mentioning DMB in reference to Lady Bird. And for closet DMB fans, Lady Bird has made it safe to once again embrace their love of the group. After seeing Lady Bird, I can finally admit I’ve been to SEVERAL Dave Matthews Band outdoor pavilion concerts & AM NOT ASHAMED ANYMORE! What’s amazing is how unaware these groups were of each other (until now). Unabashed Dave fans have spent all these years shamelessly following the band, only to learn that their favorite group is considered trash by the intelligentsia. And the people who spent those same years pretending to hate Dave are shocked to learn that the intelligentsia is filled with closet Dave fans waiting for an excuse to rediscover the band — like a horde of ants, marching, red and black antennas waving, all doing it the same way, waiting for a Lady Bird to break them free.